I haven't been crazy about the BOA buckle system on the R4 boot since the day I got it. It seems to pull at the wrong angle. It pulls from the top middle of my foot and pulls it straight down and crushes my arch. My arch then starts to cramp. I like the angle the Powerslide ankle stabilizer pulls. It pulls at a 45 degree angle to the back bottom of the boot. This pulls your heel back in the boot and slightly down and does not crush the arch. I tried to put the stabilizer over the BOA buckle but there isn't enough room. I then cut the BOA buckle off and put the stabilizer on and I couldn't be happier. 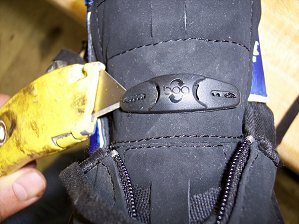 Below I show how to cut the BOA buckle off. As you can see I'm just taking a utility knife (make sure you have a new blade in) and cutting the buckle off. Here I'm cutting off the other side. Here I'm sliding the knife under the BOA tab on the tongue and cutting the threads that hold it on and taking the tab off. After this your done. Get your ankle stabilizer and put it on and you just made a good boot into a great boot. You may say "just get a boot that you don't have to do this to". I haven't found that boot yet, if I had I'd be on it. I wouldn't spend the time cutting this boot apart if it wasn't the boot I could do the double push on the best. If I want to take 2 minutes off my marathon time I would use the C4 but there is no other boot in my mind that is as fun and dynamic as the R4.